William Hill Games is another sub-section of the William Hill website which provides its own welcome bonus and library of games, separate from the main William Hill Casino or William Hill Vegas. This section of the website distinguishes itself from the William Hill Casino by specializing in licensed, branded games. William Hill Games target customers who prefer gameplay over just pure gambling, so you will find fun and unique types of games like Plants vs Zombies and Deal or No Deal. 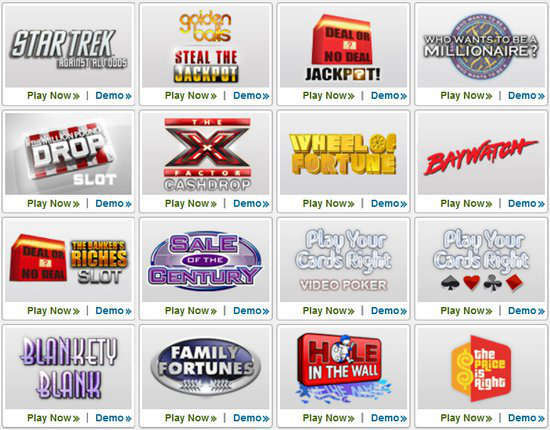 In addition, all the games at William Hill Games are accessible as instant-play without the need to download and install any software. To get started, register your new account with promo code PROMO20. 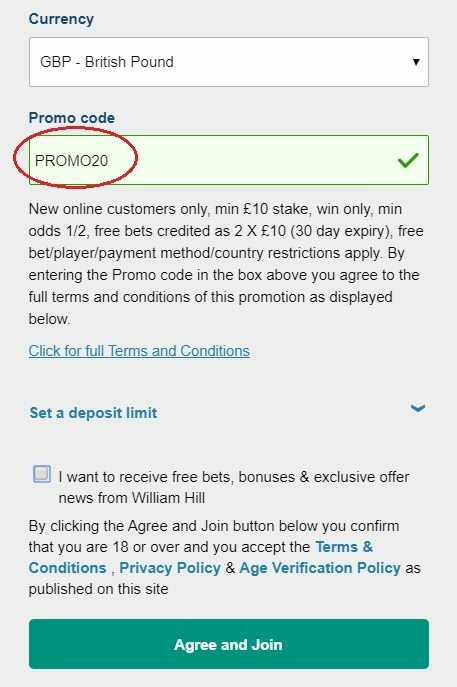 Exclusive William Hill promo codes for special promotions and betting offers. Click here to sign up to William Hill Games! William Hill Games provides an excellent welcome bonus to all customers new to the William Hill Games section of the website. This means EXISTING William Hill customers are also eligible as long as they have never played in William Hill Games. New players receive a 300% deposit bonus for up to £30! The bonus amount is immediately added to your Bonus Balance and is available to play on any Games Slots. You will need an account at William Hill to get started. If you do not yet have an account, you can find detailed instructions on registering your new casino account and promo code here. If you already have a William Hill account, you can skip ahead to the Games Bonus conditions. Please not that the amount of your initial deposit will determine your welcome bonus from the William Hill Casino. This is separate and in addition to the William Hill Games cash bonus. For the William Hill Casino welcome bonus, you can receive a 100% deposit bonus of up to £300. To receive your William Hill Games bonus, you must buy in for at least £10. Upon your deposit or transfer into William Hill Games, the total amount will appear in your Bonus Balance. So you will now see £30 in your Bonus Balance. There is a 50x wagering requirement on the Bonus Balance. However, once the wagering requirement is met, you may withdraw the entire amount, including whatever is left of the bonus. The William Hill Games welcome bonus is CASHABLE! The minimum deposit is £10, and a deposit is not essentially needed for this promotion as you can transfer funds also. This bonus cannot be used for table games or any games where the bonus bar is absent (World Cup, Top Trumps, and Baltimore Drop). The bonus bar is further detailed below. Any cashable bonus is an offer worth going after, so we think this is a must for players. While the William Hill Games welcome bonus is awesome, so is its game selection which encompasses a vast array of licensed games and massive progressive jackpots. 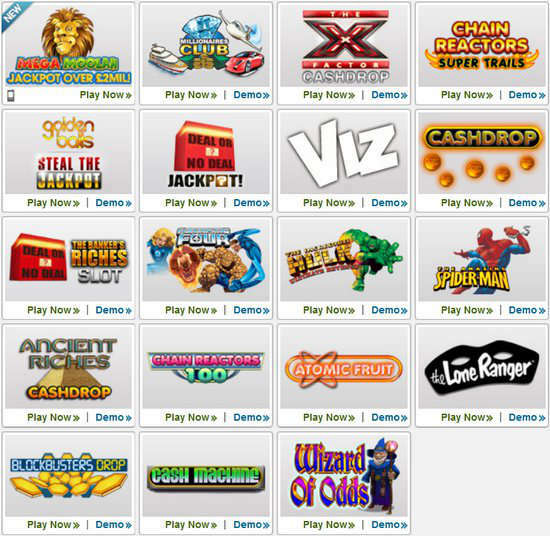 William Hill Games collects most of the best slot games game in existence. 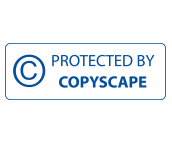 For this to occur, William Hill Games extends its Playtech-based game choices with games from other software companies such as IGT Interactive, Cryptologic, Electracade, Endemol Games, OpenBet and more. At Games, you will find the most popular slot games, as found on the casino floors in Vegas – such as Wheel of Fortune Slots, Cleopatra Slots, Monopoly Slots, and the Amazing Spider-Man, which ties into the network of Marvel progressive jackpots. William Hill Games has several slot games based on popular television shows, comic book characters, and other well known themes. You can also find well-established arcade games such as Bejeweled, Deal or No Deal Jackpot, Jenga and Monopoly: On a Roll. In addition to the welcome bonus, William Hill Games features a loyalty program that is instantly available to all players. What distinguishes this program from so many others is that this program pays out cash prizes every day. 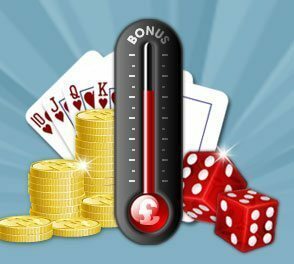 The system maintains a bonus bar meter, and when the meter reaches the top, William Hill Games immediately awards a random cash prize to the player, and prize amounts vary from £2 to £6,000. The bonus bar is visible in the top right hand corner of eligible games. The bonus bar promotion does not apply to the table games or any other game that does not show the bonus bar (World Cup, Top Trumps, and Baltimore Drop). William Hill Games does not apply a cap to the loyalty promotion at all, and it is possible for a member to max out the bonus bar many times in the same day. WilliamHill.com Games also features a bonus bar for high rollers, which has prize amounts varying from £20 to £50,000. Eligibility for the high-roller bonus bar is activated by request only. William Hill stipulates that all bonus bar money is played through once prior to withdrawal. Get your £20 free from William Hill Games! 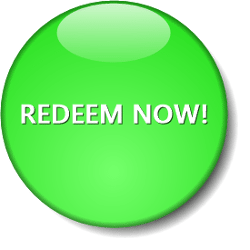 Really great bonus offers, good customer service, and a large variety of games. I recommend!